Phpwebhosting.com has very generously sponsored me all my hosting services free of charge. They are the number one PHP hosting company on the web with fantastic support and all the MySQL db functionality. A really great company indeed! Andrew, a fellow GS rider decided to sponsor me a new Givi windscreen for my bike, it all happened quite quickly whilst having a chat in the BMW Singapore workshop. Max Equipment is the Singapore dealer for Touratech, Wunderlich and Schubert helmets amongst others. A real treat to find somewhere like this after such a drought of good merchandise! 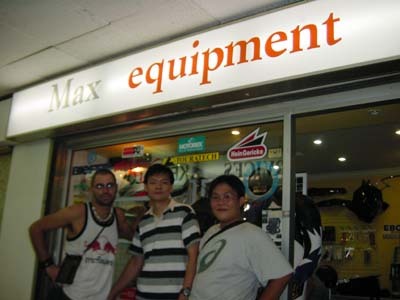 See below for a picture of me with Andrew and Kelvin of Max Equipment. PLEASE SPONSOR ME! I WILL MAKE YOU FAMOUS! HELP A POOR OVERLANDER NOW! BEFORE IT'S TOO LATE!